When it comes to coffee packaging, one size doesn’t fit all. Packing is an important step in getting roasted coffee out of the manufacturing facility, onto store shelves, and ultimately to you! Different bag sizes and types have been developed according to the needs of different customers, from the consumer who brews at home to commercial buyers who serve hundreds or even thousands of cups of coffee each day. Most wholesale customers require ground coffee pre-portioned for a single brew cycle. Because of varying different equipment sizes (and desired tastes), a single-use package can range in size from 1.75 to 14 oz. 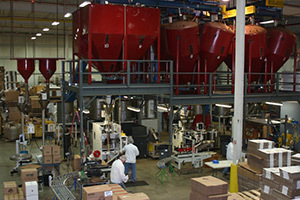 The package machine forms the packaging film, precisely measures in the grounds, and then seals the package. These individual packages are then sold by the case. For retail sales, coffee can also be packaged in branded bags varying in size from 10 to 16 oz. These bags are shipped across the country and then displayed on store shelves. Omar also packs our coffee into single serve cups, which are sold in boxes of 12 and are popular for home and office use.